SUPERVALU INC. operates as a grocery retailer in the United States. The company is member of the S&P 500 and the S&P Dividend Aristocrats indexes. SUPERVALU INC. has paid dividends for more than 70 years and consistently increased payments to common shareholders every year for 35 years. The company announced a 1.5% dividend raise in May 2009, plus a $70 million stock buyback initiative. Between June of 1999 up until June 2009 this dividend growth stock has delivered a negative average total return of 4.00% annually. The stock is trading below the levels it was changing hands a decade ago. The company has managed to deliver a 4.80% average annual increase in its EPS between 1999 and 2008. Not reflected in 2008 earnings per share is a $15.71/share non-cash impairment charge, required by Statement of Financial Accounting Standards No. 142, “Goodwill and Other Intangible Assets” to goodwill at certain Retail food reporting units and indefinite-lived trademarks and tradenames related to the Acquired Trademarks. You could read more about it here and here. For 2010 analysts are expecting a decline in EPS to $2.10, followed by rebound to $2.40 in FY 2011. 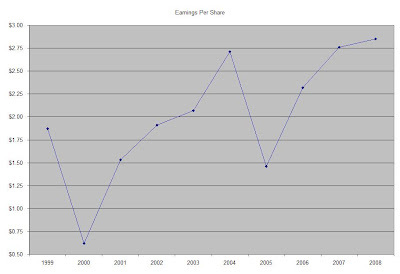 Future EPS growth would come from synergies related to the acquisition of 1124 Albertson’s stores in 2006 and new store openings. The latter are expected to slow down in FY 2010. Despite flat same store sales, the company generates sufficient cash to distribute back to shareholders in the form of dividends or stock buybacks. 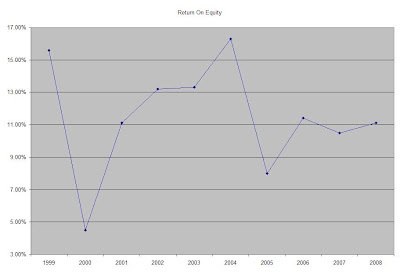 The Return on Equity has ranged over the past decade between a low of 4.50% in 2000 and a high of 16.30% in 2004. Rather than focus on absolute values for this indicator, I generally want to see at least a stable return on equity over time. Annual dividends have increased by an average of 2.80 % annually since 1999, which is lower than the growth in EPS. It is also slightly lower than the rate of inflation as well. 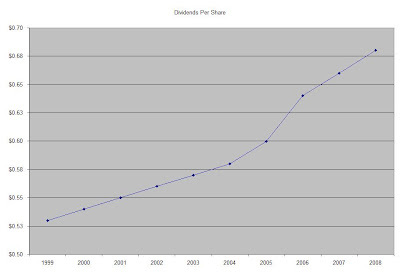 A 3 % growth in dividends translates into the dividend payment doubling every twenty-four years. If we look at historical data, going as far back as 1985, Supervalu has actually managed to double its dividend payment every twelve years on average. 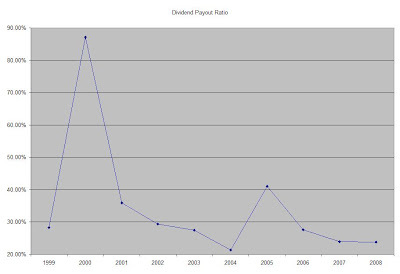 The dividend payout ratio has largely remained below 50%, with the exception of a brief spike in 2000. A lower payout is always a plus, since it leaves room for consistent dividend growth minimizing the impact of short-term fluctuations in earnings. Currently Supervalu is trading at 6.20 times FY 2010 earnings and yields 5.10%. Despite its slow dividend growth, I like the above average dividend yield that the stock is offering, relative to other food retailers such as Safeway (SWY) and Kroger (KR). I also like the low price/earnings multiple. I would consider initiating a small starter position in Supervalu (SVU) on dips.